Competitions catered towards schools within a set locality or academy trust. 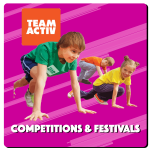 Team Activ staff will deliver a one off or series of competitions, hosted at your school or at various schools in your cluster or trust. These competitions are bespoke to suit the needs of your school group and can be delivered on a specific date or set dates throughout the year. The sport or activity is delivered to your needs and can be one sport/activity or a series of different sports/activities throughout the year. The competitions can take place in the morning, afternoon or after school and last 2 hours. We also give your older students the chance to become leaders for the event with each being awarded a badge and certificates for becoming a Team Activ Leader. Festivals aimed at improving Determination, Honesty, Confidence, Resilience, Respect & Teamwork for your pupils, designed to benefit your children’s school lives. These competitions are bespoke to suit the needs of your school and can be a themed event not only on the points above but on any element you feel would benefit your pupils or school life. A one of festival or series of festivals which can take place within school or off school site. These festivals are designed to encourage and develop the children’s use of subjects such as Maths, English and Art, using sport and physical activity. These festivals are bespoke to suit the needs and requirements of your school and can be tailored to any area of the curriculum in addition to the subjects above. Our Staff and Adult Tournaments will provide the opportunity for your staff to build relationships and have fun outside of the school environment, all whilst meeting and creating networks with colleagues from other local schools. Initially, a competition will run each term and will be based on the sports which are being delivered for your children during that term. These competitions have the same structure as all the children’s events and are designed to get your staff and schools healthy, happy and working together.